When riding strapless on a surfboard, the position of your feet is vital but there is more to consider than most people may first imagine. Though the lack of straps leaves us susceptible to suddenly losing our balance and board, it also allows us the flexibility to position our feet in the optimal position for the task at hand. And then when it’s time to spring into action, BAM, that back foot jumps straight back to the tail – whether it helps get maximum pop for a freestyle trick or every inch of control needed as he drops down a wave face. Finding the correct position for your front foot to keep the board balanced and stop it from bouncing around. It may well be further forward than you think. Your front foot can be positioned with the heel near the board’s rail or centred in the middle of the board. Then you have the option of having it at different angles. Where to place your back foot for general riding and maximise your ability to get upwind. Particular important when underpowered or in lighter winds. This is the essential movement that gets your back foot right back and positioned correctly whenever you want to turn the board. 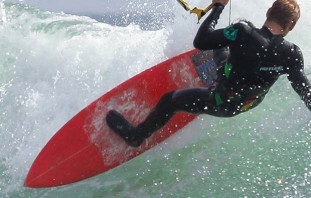 Of course, foot position is just a small part of getting a great stance and then understanding the techniques needed to handle the power from your kite and control your board accordingly. Moving from a twintip requires some fundamental changes in your weight distribution and the way in which you apply pressure to the board if you hope to get the most out of it and ultimately be able to ride waves with balance, power and control. Next time you get out on the water I want you to try altering your foot positions in each of the ways listed above. See how it affects your control and speed – even if it makes riding harder, try it and see what else you need to do to keep riding in this less than ideal position without wiping out. It should mean that when you shift back to the correct position you better appreciate why it works. Let me know how you get on in the comments. Our Stance, Control and Speed video is a great foundation builder and available to watch now on Progression Player for Desktop or in our mobile Player App (iOS or Android). 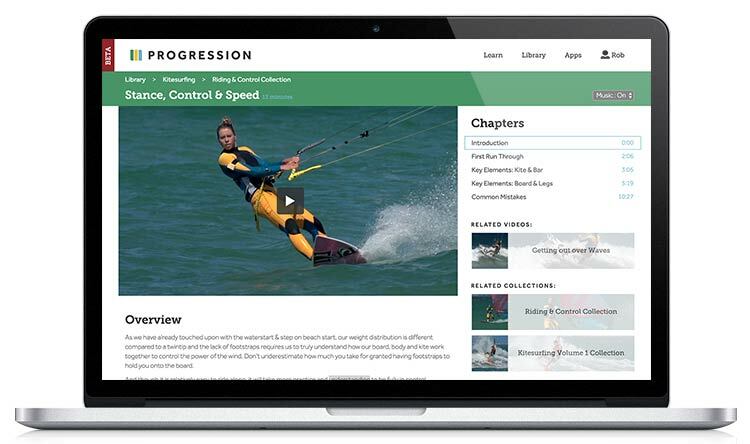 Find out more by watching the full Introduction videos for each of the main Kitesurfing Collections, all you need is a free Progression Profile to get started.